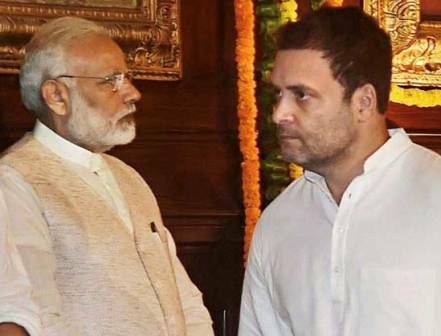 New Delhi, March 30: Congress President Rahul Gandhi on Friday taunted Prime Minister Narendra Modi, asking him if he was now penning a book for students on how to de-stress after their lives were “destroyed” following the leak of CBSE question papers. Gandhi said Modi “wrote ‘Exam Warriors’, a book to teach students stress relief during exams. Ahead of the exam season, Modi came out with a book “Exam Warriors” released in February that advises students how to fight exam stress. The Prime Minister has extensively spoken about exam stress in his monthly “Mann Ki Baat” radio address for four exam cycles since he came to power in May 2014. He also held a televised interactive session with students all over the country, giving them a pep talk on how not to fear exams. But the government has came under huge criticism after question papers for Class 10 maths and Class 12 economics were circulated on WhatsApp days before examinations were held on Monday and Wednesday, respectively. The Central Board of School Education acknowledged that the question papers were “leaked”.